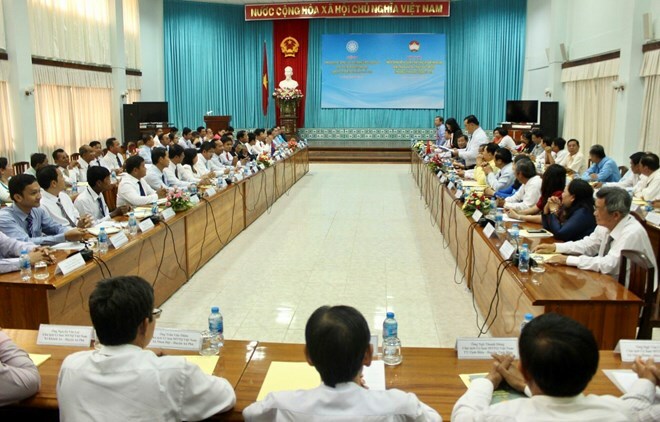 An Giang (VNA) – The Vietnam Fatherland Front (VFF)’s chapter in southwestern An Giang province and the Solidarity Front for the Development of Cambodian Motherland (SFDCM)’s chapters in Kandal and Takeo provinces have effectively implemented their cooperation programmes, heard a conference in An Giang province on March 27. This contributed to maintaining social order and safety, and security in the border area over the past five years, participants further affirmed, adding that the effort has helped prevent and combat crimes in the principles of respecting independence, national sovereignty and territorial integrity of each side. Army, police, border guards, navy and relevant forces of the three provinces have coordinated effectively, with regular information exchanges and joint patrols, helping protect border markers and swiftly prevent sabotage activities. Competent forces have also paid attention to communications work and educated local people to abide by border-related laws. Cooperation between the Vietnamese and Cambodian agencies in building a common border of peace, friendship and cooperation for mutual development has been tightened, contributing to the development of the two countries during regional and international integration. The sides signed a memorandum of understanding (MoU) on cooperation for 2019-2021, under which they will encourage locals not to join cross-border smuggling activities or to migrate illegally. They will also work to raise public awareness of the significance of border demarcation and marker planting. Joint efforts will be made to swiftly detect and prevent plots and acts that cause border instability, aiming to maintain solidarity and friendship between the people and administrations of the provinces.